The Forbidden Kingdom of Mustang lies north of the main Himalayan range of Nepal. Mustang was a part of the Tibetan Kingdom of Gungthang until 1830’s and maintained its status as a separate principality until 1951. Its unofficial capital Lo Manthang still remains a kingdom within Nepal. The King of Lo Manthang retains his title and he has been given the honorary rank of Colonel in the Nepal Army. Trekking in Mustang was officially opened in 1992 to limited numbers of trekkers each year in order to protect and conserve the local Tibetan tradition and the fragile environment. This trek takes you into this fabled forbidden kingdom of vast arid valleys, eroded canyons, yak caravans, colorful-painted mud brick houses, and stupendous views of the majestic mountains. Mustang Trek is basically a remote trek to one of the least visited lands in western Nepal. It was a forbidden kingdom of the ancient kings, and thus, the region remained unknown to the travelers for many decades which helped indeed to nurture the beauty of these mountains, and its culture stayed isolated and well protected. The trekking location is divided into two regions; Upper Mustang Trek and Lower Mustang Trek both with unique features that make the trekking experience undoubtedly one of the most beautiful experiences of your life. The naive mountains in these regions have an elevation up to 4000m; the journey uphill offers the traveler incredible views of the Buddhist monasteries that reflect the ancient art and culture of the inhabitants of the region along with breathtaking views of the panorama that surrounds the deserted valley. The thrilling trek to Upper Mustang begins from Pokhara, and then a flight to Jomsom and the trekking routes extend from Chele, Ghami, Syangboche, Gharang, and Lomanthang. Apart from the mystical mountains, you can get to see the mud-built houses, Yaks used by locals for transport, eroded canyons, and rifts. The white snow clad Annapurna, Dhaulagiri and Nilgiri Himalayan ranges are the highlights of the trek. One of the interesting facts is that the tracks are equally favorable even during the monsoons. The Lower Mustang trekking begins in the northern central part of the region at the top of the River Kaligandaki, the gorge which is the deepest gorge of Nepal. The journey is full of adventure as the routes are challenging here. The place gives an isolated feel and the peaceful Buddhist hymns ringing from the monasteries are loved by peace seekers. • Trekking in the remote and restricted region of Nepal. • Mountain flight through the worlds deepest gorge with Mt. Annapurna I (8093 m) and Mt. Dhaulagiri (8167 m) on either sides. • Exploration of the mystic cave monasteries and forts, including the Raja’s palace at Lomanthang. Day 4. Flight Pokhara- Jomsom (2743 m), trek to Kagbeni (2810 m) 3 hrs. Day 9. Lo Manthang (3800 m). Rest day and explore heritage sites. Day 10. Day hike to Nyiphu and Garphu monasteries/caves and villages in the north of Lo Manthang. We depart from the hotel early in the morning. We drive west of Kathmandu following the winding road over the valley alongside the Trishuli River brings us to a small bustling highway junction called Muglin. Here we cross a suspension bridge and leave the East West Highway and continue on the Prithvi Highway that connects Kathmandu and Pokhara. After the suspension bridge over the confluence of Trishuli and Marshyangdi, we drive alongside the Marshyandi River towards Pokhara. On a clear day, the mighty ranges of Annapurna, Ganesh and of Manaslu are intermittently in view. Upon arrival to Pokhara, we check in to our hotel. The rest of the afternoon is free to explore the town. Early morning flight to Jomsom which takes about 25 min. The views of the Annapurna range and Dhaulagiri range are spectacular. The plane actually flies through the world’s deepest gorge, with Annapurna I (8091m) on the right and Dhaulagiri (8167m) on the left. We will spend some time in Jomsom allowing our porters to arrange their loads and then trek for 2 1/2 hrs to Kagbeni. The entire trail to Kagbeni is on the Kaligandaki river bed. Kagbeni is the entry point of the restricted region of Mustang. There is a trail up the east bank of the Kaligandaki that climbs over many ridges as it heads north and reaches Tangbe village. The town is a labyrinth of narrow alleys amongst whitewashed house, fields of buckwheat, barley, wheat and apple orchards. Nilgiri peak, which dominates the southern sky line at Kagbeni, continue to loom massively at the foot of the valley. Beyond Tangbe, we reach Chhusang village and crossing the river, continue climbing north up the trail to a huge red chunk of conglomerate that has fallen from the cliff above, forming the tunnel through which the Kaligandaki valley and the climbs steely up a rocky gully to Chele at 3030m. The culture changes from the Manangi culture to the Tibetan culture of Lo. The climbs continues along steep, treeless, waterless terrain, along the side of a spectacular steep canyon to a pass and chain of rock at 3540m. Then the trail makes a long gradual descent to some chortens on a ridge, before descending further on a pleasant trail to Samar. The Annapurna, still dominated by Nilgiri, is visible far to the south. The trail climbs above Samar to a ridge, then descend into a large gorge and the trail goes into another valley field, crosses a stream and climbs up to a ridge at 3800 Mt. The route climbs over yet another pass, follows a ridge and then descends to Shyangbochen. From there gently climb to a pass at 3770m and descend to Geling. From Geling, the trail climbs gently to most interesting pass on your trek, Nyi La and descends beneath blue, grey and red cliffs across the valley to a bridge over the Tangmar Chu(river,) then climbs past what is perhaps the longest and most spectacular mani(prayer wall) in Nepal. Climbing over another pass at 3600m, the route makes a long gentle descent to Charang. The huge five-story white Dzong(fort) and red gompa(Buddhist temple) contains a fascinating array of statues and Thankas as well as many large paintings of seated Buddhas. The trail descends about 100 metres from Charang, crosses the Charang-Chu, climbs steeply up a rocky trail to a cairn on a ridge and continues to climb. Finally from a ridge at 3850m, there is a view of the walled city of Lo. After a short descent, cross a stream then climb up into the plateau of Lo Manthang. Another day in Lo Manthang gives you the chance to explore its many sights; the Tall Champa Lakhang(God house,) the red Thugchen Gompa, Chyodi Gompa and the Raja’s Palace; as well as to gaze at the surrounding panoramic views of the Tibetan Plateau. Another day for sight seeing around Lo Manthang. This is an opportunity to visit two other villages on your return trek. The trail climbs steadily to the pass marked by a cairn, offering a last glimpse of LO Manthang. The trail contours past two small ridges and valleys and across a ridge at 4070m then descends across to the south through two more valleys, meadows and a stream. The trail then makes a long rocky descent to Gekar. LO Gekar Gompa is older than Samye Gompa in Tibet and one of the oldest Gompa in Nepal. Then crosses a ridge after a little climbing and drops down steeply to Thamar village. The trail descends along the side of the stone walls and fields of extensive villages, then climbs to a ridge. It is a short descent to Ghami. From Ghami the trail climbs to Nyi La and descend to Samar through the same route. We trek back the same trail as we had taken on the way up. A very short walking day to Jomsom. The afternoon can be utilized walk around the beautiful village of Jomsom. We normally reach Pokhara early in the morning, so you can have a leisurely day. Overnight in Hotel. • All internal transportation (arrivals and departures), in private vehicle. • Round trip drive Kathmandu / Pokhara / Kathmandu in private vehicle. • Accommodation on B/B plan, in tourist class hotels on twin share basis for 3 nights in Kathmandu and 3 nights in Pokhara. 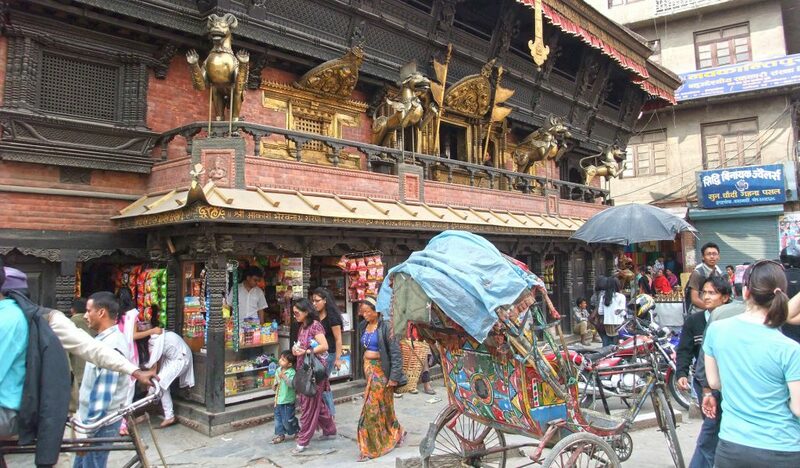 • Half day sightseeing in Kathmandu with lunch. • Use of a personal trek pack consisting of a duffel bag, down jacket, rainponcho, sleeping bag and inner liners for the sleeping bag. • Boiled and treated water 2 times a day. • All accommodations in lodges while on trek. • Restricted Area Permit for trekking in Upper Mustang. • Private room accommodation in unless a single supplements is paid.